What is a Node framework? When Node.js was introduced to the tech community in 2009 as a tool for building scalable server-side web applications, it came with a lot of benefits which includes but not limited to the usage of event-driven non-blocking input/output model, single-threaded asynchronous programming amongst others. The fact that, as a developer, you can easily use the same language both for the client-side and server-side scripting easily increased the quick adoption and rapid the usage of Node. 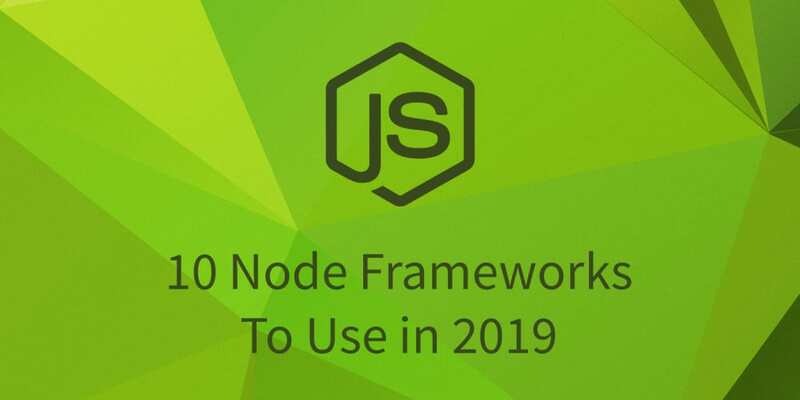 As we look into 2019, I will list some of the most popular Node.js frameworks that you should consider using for building web applications irrespective of the size. A Node.js framework is just some abstract design, built out of Node.js, that embodies the control flow of the given framework’s design. So it is almost like the skeleton of a program whereby the customised codes you write kind of makes up as the meat that completes the program. So for every Node.js function, there would be some generic implementation unique to the framework which would then require the user to follow the lead of the framework by adding more codes to define its use case. Node.js frameworks are mostly used because of their productivity, scalability and speed, making them one of the first choice for building enterprise applications for companies. Node.js allows you to write the same language for both your front-end and backend, saving you the stress of learning a new language for some simple implementation, and also helping you maintain the same coding pattern all through. By using a framework, you can work with a set of tools, guidelines, and recommended practices that help you save time. It also can help solidify the code standards across a team of developers. Selecting a framework can be a bit tricky and subjective to its use case. This is because we choose based on a particular feature we like. Ranging from the weight of the framework on the application, speed, simplicity, learning curve, flexibility and configuration, use case or maybe even popularity in some cases, GitHub stars. Stars aren&apos;t everything so we&apos;ll be organizing by what we&apos;ve seen to be popular on Scotch.io. AdonisJsis a Node.js framework. From the official documentation, "AdonisJs is a Node.js MVC framework that runs on all major operating systems. It offers a stable ecosystem to write a server-side web application so that you can focus on business needs over finalising which package to choose or not." Adonis is billed as the Laravel of Node. Simplicity and a focus on getting things done. AdonisJs has a support for an ORM is made with SQL-databases in mind (PostgreSQL). It creates efficient SQL-queries and is based on active record idea. Its query builder is easy to learn and allows us to build simple queries quickly. AdonisJs has good support for No-SQL database like MongoDB too. It&apos;s MVC structure is quite similar to Laravel, so if you&apos;ve been using Laravel for web development, AdonisJs will be a walk in the park. To get started easily check out this comprehensive article by Chimezie here on scotch.io. Express.js is a fast, non-opinionated, minimalist web framework for Node.js. It is simply a technology built on Node.js which behaves like a middleware to help manage our servers and routes. Looking at the asynchronous nature of Node.js and the fact that Express.js was built on node, the ability to build a light-weight application that can process more than a single request seamlessly actually depends on the serving capability of technologies like express. It’s robust API allows users to configure routes to send/receive requests between the front-end and the database (acting as a HTTP server framework). A good advantage with express is how it supports a lot of other packages and other template engines such as Pug, Mustache, EJS and a lot more. Majorly focused on browsers, making templating and rendering an almost out of the box feature. Looking at this framework and all it’s exciting abilities, I do not see it going away anytime soon. Meteor stands the capability of serving large projects like reaction commerce( known to be one of the largest and most popular e-commerce open source projects). The most fascinating aspect of the Meteor framework is the very rich and organised documentation/large community it has, helping users learn fast by reaching out and getting their hands dirty with projects, very fast. With the fact that meteor is leveraging on the Facebook GraphQL datastack to come up with meteor Apollo, as far back as 2016, only indicates that they have good plans and a visionary perception of what the future holds for data, how it is managed and how it flows. If there is any list of Node.js frameworks to watch out for, I would probably be arrested if I did not add Meteor to that list. Nest also makes use of Express, It provides an out of the box application architecture which allows for the effortless creation of highly testable, scalable, loosely coupled, and easily maintainable applications. Nest CLI can be used to generate nest.js applications with a lot of features out of the box. According to the information on the website, one can contact the nest community of developers behind the nest framework to find out more about expertise consulting, on-site enterprise support, trainings, and private sessions. Isn’t that cool? Well I guess it is, and I also think this also should make it into the list of Node.js frameworks to look out for in 2019. According to the official site, Sails is another Node.js framework used to build custom enterprise-grade Node.js apps. It boasts of being the most popular MVC Node.js framework with the support for modern apps requirements. The APIs are data-driven, with a scalable service oriented architecture. Let us take a closer look at what they mean here. Sails bundles an ORM, waterlines, that makes compatibility possible with almost all databases, going as far as providing a huge number of community projects. Some of its officially supported adapters include MYSQL, Mongo, PostgreSQL, Redis, and even Local Disk. Looking at the backend, Just by running an installation command, `sails generate api bookstore` for instance, sails blows your mind by providing you some basic blueprints, without you writing any codes at all. Great frontend compatibility with other frontend technologies. Enables faster build of REST API. Compatible with almost all database, thanks to its waterline ORM. Referred to as the next generation web framework for Node.js(according to the website), Koa was created by the same team that created Express.js, making it seem like it would pick up from where express left off. Koa is unique in the fact that it uses some really cool ECMAScript(ES6) methods that have not even landed in some browsers yet, it allows you to work without callbacks, while also providing you with an immense increase in error handling. it requires a Node.js version of at least 0.11 or higher. According to the website, Koa does not bundle any middleware within core, meaning the middlewares are more cascaded/streamlined, and every line of code is quite elegant and granular, thereby allowing you to structure the parts however you want(component-based middlewares). This makes the framework to have more control over configurations and handling. Koa became futureproof owing to the fact that it could actually ditch the holy grail of asynchronous functionality: callbacks. This is definitely a framework for the future and I am almost beginning to see that if an article for frameworks to lookout for in the year 2020 comes out, it would still probably make the list. LoopBack is another Node.js framework with an easy-to-use CLI and a dynamic API explorer. It allows you to create your models based on your schema or dynamic models in the absence of a schema. It is compatible with a good number of REST services and a wide variety of databases including MySQL, Oracle, MongoDB, Postgres and so on. Add-on components for file management, 3rd-party login, and OAuth2. Most of these details were collected from their Website/documentation which I found very exciting to go through and even try to get a basic setup up, Indicating that they have a well structured documentation and a community distributed across different media( StrongLoop blog, LoopBack Google Group, LoopBack Gitter channel ). For instance, the Loopback blog provides lots of tutorials and use cases on how to leverage the use of the technology in different ways. Amongst some of its powerful users are Go Daddy, Flight Office, Bank of America(Meryll Linch), Symantec, Intellum, ShoppinPal and so on. Just like ExpressJs, the common hapi.js(supported by Walmart Labs) is a Node.js framework that helps serve data by intermediating between the server side and client. It is quite a good substitute for Express(they both have their unique features). Hapi is a configuration-driven pattern, traditionally modeled to control web server operations. A unique feature it has is the ability to create a server on a specific IP, with features like the ‘onPreHandler’, we can do something with a request before it is completed by intercepting it and doing some pre-processing on the request. Considering it’s ‘handler’ function where we can call a route and still pass some configurations while making the requests, just to get the function to do something specified in the configuration. This handler, from what we see, acts like a pseudo-middleware. There is a deeper control over request handling. Provides the availability of caching, Authentication, and input validation. Has a plugin-based architecture for scaling. Provides you with really good enterprise plugins like the joi, yar, catbox, boom, tv, travelogue, and so on. HapiJs might not be as popular [github stars: 10,371] as Express but it has some good backing up and it seems to be gaining some grounds too. It does not seem like it is slowing down its mark and relevance anytime soon. According to the Derby.js site, it is a full stack Node.js framework for writing modern web applications. Derby has been around a little while, quite long enough to have proven itself to hop into 2019 and rock some chords. Let’s see what we have here. DerbyJs provides you with seamless data synchronisation between your server and client with an automatic conflict resolution powered by ShareDB&apos;s operational transformation of JSON and text. It permits you the opportunity to add customised codes to build highly efficient web applications. Total.js boast of being a very fast development Node.js framework, that requires little maintenance, with a good performance and a seamless scaling transition. It shows some promise by giving some insight on their website, where they ask for visitors willing to contribute to the growth of the framework. So far the Total.js team has spent some time trying to get more premium sponsors to join them. This is another indication that they have plans to expand and should be checked out for more growth in the nearest future to come. Total.js has some really beautiful versions like the Total.js Eshop, which contains a user interface optimized for mobile devices, and downloadable by all premium members. The Eshop is one of the best Node.js e-commerce system. This is because of its many versions of unique content management system(CMS). If there is anything we can pick from this article, I can bet you must have noticed before now that picking a framework is based on what you actually want to achieve with it. The Node.js frameworks above have purely shown us that whatever framework we are going for, there is an open and welcoming community out there solving issues and ready to aid you with learning the basics of that particular framework, which a is vital factor to look out for amongst lots more other factors like GitHub contributions, stars, issues and so on. Just for the fun of it, you can find a lot more of Node.js frameworks here. Do you know of any other awesome Node.js framework that you feel its worthy of being added to the list? please feel free to mention it in the comment section below. I do hope you find this post very helpful. Happy coding.